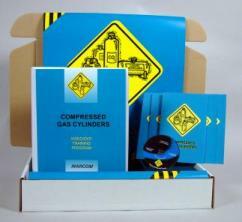 MARCOM's "Compressed Gas Cylinders" Safety Meeting Kit™ provides the information employees need to handle and transport these potentially volatile storage containers. In today's work environments, compressed gas is used for many things... refrigeration... welding... heating... and a number of other functions. Compressed gas can be dangerous, and employees who work with them need to know how to handle them properly. Materials in the kit include a video program, five motivational posters, and 30 employee booklets. The posters in the kit remind employees to work safely and avoid injuries when handling compressed gas. The videotape and employee booklets include information on associated hazards, moving and transporting cylinders safely, positioning cylinders properly, proper "hook-up" procedures, safe storage practices, storage "incompatibilities", and more. The video program in the kit comes with a comprehensive leader's guide, reproducible scheduling & attendance form, employee quiz, training certificate and training log.